President Donald Trump (center) speaks during a luncheon with envoys representing countries of the United Nations Security Council, in the State Dining Room of the White House in Washington, Jan. 29, 2018. U.S. President Donald Trump’s rejection of peace talks with the Taliban has provoked a strong reaction from the Islamist insurgency, while lead Afghan clerics advocate against continuation of military action to end the war in Afghanistan. Trump ruled out talks with the insurgent group and vowed to “finish” them in the wake of a wave of terrorist attacks in the Afghan capital, Kabul, that killed hundreds of people. “They’re killing people left and right. Innocent people being killed left and right,” Trump told a U.N. Security Council delegation at the White House on Monday. “So we don’t want to talk with the Taliban. There may be a time, but it’s going to be a long time,” noted the U.S. president, suggesting a stronger military campaign against the Taliban was imminent. A spokesman for Afghan President Ashraf Ghani on Tuesday stopped short of supporting Trump’s idea of rejecting talks with insurgents. Shah Hussain Murtazawi told VOA the Afghan government will now use all available means to stop the Taliban from conducting terrorist attacks. “The Taliban have crossed a red line and lost the opportunity for peace...We have to look for peace on the battlefield. They have to be marginalized,” Murtazawi pledged. He said a suicide car bombing last Saturday was the “red line.” The blast killed more than 100 people and wounded 250 others. FILE - Afghan policemen inspect the site of bombing attack in Kabul, Afghanistan, Jan. 28, 2018. On Saturday, a car bomb ripped through a crowded area outside a government building, killing more than 100 people. An Afghan offical said that with the attack, the Taliban, which claimed responsibility, crossed a "red line." On Tuesday, an Afghan council of 100 prominent clerics met in Kabul to denounce the militant violence as un-Islamic. The council’s spokesman, Mohammad Qasem Halimi, while talking to reporters, declined to directly comment on Trump’s refusal to engage in talks with the Taliban, but maintained that Islamic Afghanistan “faithfully” believes in resolving issues through peace negotiations. “I want to stress that those [the Taliban] who are not coming to peace talks are against the [Islamic] religion. I am hopeful that discussing peace on the table talks can solve the problems. But we have not yet come to the conclusion that war is the way forward to find peace, particularly in Afghanistan,” Halimi said. Visiting U.S. Deputy Secretary of State John Sullivan explained to reporters in Kabul Tuesday night that there was no change in Washington policy and the stepped up U.S. military pressure on the Taliban is meant to push insurgents into peace talks. Civilians have borne the brunt of the Afghan conflict in recent years. Observers see the stepped up Taliban attacks as a reaction to recent battlefield setbacks and killings of key Taliban commanders in U.S.-led international airstrikes. The insurgency has refused to engage in peace talks until all foreign forces leave Afghanistan. 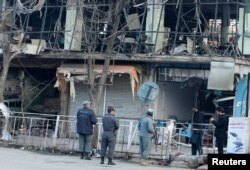 The United States believes the Haqqani network, a faction within the Taliban, plotted Saturday’s attack. Afghan officials have also long accused Pakistan of supporting and sheltering the Taliban and Haqqanis. The Pakistani government denies the charges and has condemned the recent series of “heinous attacks” in the neighboring country. Pakistani authorities also cite stepped up border scrutiny measures in addition to sustained counterterrorism operations on their side. Earlier in January, about 1,800 Pakistani clerics issued a fatwa, or religious decree, declaring suicide bombings and anti-state acts as un-Islamic. Afghan officials and clerics, however, dismissed the move as insufficient for it being limited to Pakistan only. Pakistani Foreign Ministry spokesman Mohammad Faisal rejected the criticism as misplaced and declared the religious directive as a "landmark" development for countering religious extremism and terrorism. “It [the fatwa] goes on to prohibit the use of Pakistani territory for the propagation of any kind of terrorism...Afghanistan may on its part seek a similar fatwa from its ulema [body of religious scholars]. The application of fatwas is universal and not restricted to geographical limits,” Faisal maintained. Islamabad also alleges that anti-state militants are using bases in Afghan border areas to launch attacks against Pakistan, charges Kabul denies. An improvement in strained relations between Pakistan and Afghanistan is seen as key to effective regional counterterrorism efforts.